Successfully Added Hard Drive Media Player and TV Recorder (DVR for SATA HDD) to your Shopping Cart. Hard Drive Media Player and TV Recorder (DVR for SATA HDD) for recording your favorite TV shows directly to your SATA hard drive or using as a portable digital media storage drive. Are you still using your hard disk only to store files? Get this DVR hard drive media player and TV recorder for your 2.5 inch SATA HDD and get with the times! 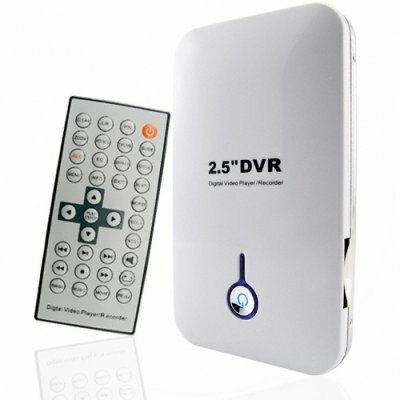 With this digital video recorder (DVR), you can turn your hard drive into a fully functional digital video recorder (DVR) for recording your favorite shows straight from TV and playing back tons of audio and video media files on your TV, completely independent of a computer. When you see how easy using this DVR Hard Drive Media Player and TV Recorder (for SATA HDD) is, you'll wish you had bought it earlier! Connect your DVR media player to TVs, LCDs, or any other device that has AV OUT. Once you've recorded your favorite shows, play them back on your TV or LCD screen, or load them on to your computer to share with your friends. Navigating through the DVR media player with the remote control is easy, and just one click lets you access media files by type: music, videos, and pictures. Video playback has all the controls you expect from a DVR: play, pause, stop, fast-forward, rewind, next track and previous track. Scheduled recording lets you record TV while you're away, and instant one-click recording lets you capture programs while you watch. This DVR media player combines functionality with portability and style. Going to a friend's house to catch the football game? Take the DVR media player along with you to record all the action. Want to share your videos and music with your friends? Slip the DVR media player into your pocket and take your entire collection of downloaded TV shows, movies, music, and pictures with you anywhere you go. Stock up on the CVSB-878 for your store or internet shop, and your customers will thank you. Buy one for yourself, and you will thank yourself! Chinavasion's unbeatable factory-direct prices and no minimum order quantity (M.O.Q.) let you save more when you buy more. Easy to use HDD enclosure that works as a media player, recorder and portable storage device. Internal formatting (the enclosure's operating system can format your drive for you). Files can be loaded through USB connection to PC and SD/MMC cards. Supports a max 250GB SATA hard drive (not included). Note: This product is not sold with a Hard Disk included. You will need to purchase a hard disk separately. Easy hard drive installation; We even give you a screwdriver! What are the advantages of this model versus others I have seen? This is a great TiVo alternative for those whose geography excludes them from owning TiVo or those considering TiVo but have been dissuaded because of the various restrictions that come with owning a TiVo. Who needs an external HDD enclosure? Everyone! Backing up important data should be a priority for anyone living in the modern digital age. Additionally, transporting files in excess of 32 GBs is impossible for most USB drives and SD cards. This unit supports HDD devices up to 250GB so it is perfect for the modern digital home or office.